The Philadelphia Phillies visit AT&T Park on Saturday, August 19, 2017 to play the San Francisco Giants. The probable starters are Jerad Eickhoff for the Phillies and Ty Blach for the Giants. The opening line for this matchup has Philadelphia at +141 and San Francisco at -151. The Phillies have a 53-57-9 over/under record and a 61-58-0 run line mark. The Giants are 50-73-0 against the run line and have a 58-54-11 over/under record. The Phillies have a 43-76 overall record this season. Starting pitcher Jerad Eickhoff has a 3-7 record with an earned run average of 4.33 and a WHIP of 1.46. He has 106 strikeouts over his 116.1 innings pitched and he's given up 123 hits. He allows 9.5 hits per 9 innings and he has a FIP of 4.08. The bullpen has an earned run average of 4.37 and they have given up 398 base hits on the year. Teams are hitting .257 against the bullpen and they've struck out 381 hitters and walked 161 batters. As a team, Philadelphia allows 9.3 hits per nine innings while striking out 7.9 batters per nine innings. They are 20th in the league in team earned run average at 4.57. The Phillies pitchers collectively have given up 1,084 base hits and 535 earned runs. They have allowed 163 home runs this season, ranking them 9th in the league. Philadelphia as a pitching staff has walked 385 batters and struck out 926. They have walked 3.3 men per 9 innings while striking out 7.9 per 9. They have a team WHIP of 1.39 and their FIP as a unit is 4.61. As a team Philadelphia is hitting .246, good for 24th in the league. The Phillies hold a .403 team slugging percentage and an on-base percentage of .311, which is good for 28th in baseball. They rank 23rd in MLB with 8.4 hits per game. Freddy Galvis is hitting .258 with an on-base percentage of .308. He has 117 hits this season in 453 at bats with 49 runs batted in. He has a slugging percentage of .413 and an OPS+ of 89. Odubel Herrera is hitting .287 this year and he has an on-base percentage of .333. He has totaled 125 hits and he has driven in 46 men in 435 at bats. His OPS+ is 109 while his slugging percentage is at .467. The Phillies have 1,001 hits, including 216 doubles and 120 home runs. Philadelphia has walked 356 times so far this season and they have struck out 1,022 times as a unit. They have left 804 men on base and have a team OPS of .713. They score 3.93 runs per contest and have scored a total of 468 runs this year. San Francisco has a 49-74 overall mark this year. With an earned run average of 4.37, Ty Blach has a 8-8 record and a 1.32 WHIP. He has 64 strikeouts over the 134 innings he's pitched. He's also given up 147 hits. He allows 9.9 hits per nine innings and his FIP stands at 4.04. The bullpen has an earned run average of 4.10 and they have given up 373 base hits on the year. Teams are hitting .258 against the Giants bullpen. Their relievers have struck out 341 batters and walked 168 opposing hitters. As a team, San Francisco allows 9.6 hits per nine innings while striking out 7.6 batters per nine innings. They are 18th in the league in team earned run average at 4.52. The Giants pitchers as a team have surrendered 1,191 base knocks and 558 earned runs this season. They have given up 133 home runs this year, which ranks 25th in Major League Baseball. San Francisco as a staff has walked 376 hitters and struck out 941 batters. They give up a walk 3 times per 9 innings while they strike out 7.6 per 9. Their team WHIP is 1.41 while their FIP as a staff is 4.12. As a team, they are batting .246, good for 25th in the league. The Giants hold a .376 team slugging percentage and an on-base percentage of .307, which is good for 29th in baseball. They rank 20th in MLB with 8.5 hits per contest. 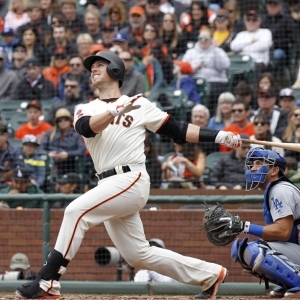 Buster Posey comes into this matchup batting .319 with an OBP of .410. He has 121 hits this year along with 52 RBI in 379 AB's. He maintains a slugging percentage of .475 with an OPS+ of 134. Eduardo Nunez is hitting .321 this season and he has an OBP of .348. He has collected 122 hits in 380 at bats while driving in 44 runs. He has an OPS+ of 111 and a slugging percentage of .455. The Giants as a unit have 1,048 base hits, including 222 doubles and 96 homers. San Francisco has walked 357 times this year and they have struck out on 894 occasions. They have had 835 men left on base and have an OPS of .682. They have scored 3.98 runs per game and totaled 490 runs this season. Who will win tonight's Phillies/Giants MLB game against the spread?